Fr Len was ordained in 2013 and studied at the Beda College in Rome which is a seminary for late vocations. 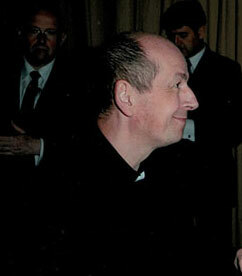 Previously, Fr Len worked for Royal Mail as a manager in the Bromley area. He attended St Joseph’s College in Beulah Hill where his father taught for many years. Fr Len started thinking about the Priesthood when his father was dying and was impressed by the pastoral care of a Priest ministering to his father. This came as quite a shock after a difficult and turbulent few years with the Church. Reading scripture and praying the Divine Office led to him falling in love with God and his Priesthood grew from there. 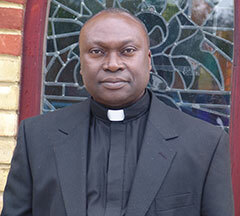 After being ordained at St Georges Cathedral in 2013 by Archbishop Peter Smith, Fr Len was appointed to St Boniface in Tooting as an Assistant Priest, then in 2015 was appointed Parish Priest of St Margaret Clitherow in Dulwich Wood Park. 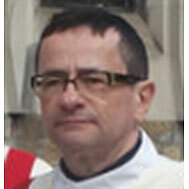 Fr Len has just completed a Master’s degree in Theology at Heythrop College in Kensington, he is on the on-going formation committee for the Diocese and works with an organisation called Retrovaille who help couples who are experiencing marriage difficulties. I was born in Battersea in 1958. The second youngest of 12, I attended Battersea Park parish (sometimes Stockwell) and went to St Mary’s primary school. In 1970 I went to Bishop Thomas Grant school leaving in 1975 with one much prized O’level. I started work in New Covent Garden Flower Market soon after and was there for 35 years. In 1982 I married Wendy, moving first to Streatham and then in 1986 to Thornton Heath. Wendy and I have two daughters who both attended St James The Great and St Philomena’s. Wendy works as a Nursery Nurse at St Chad’s school in South Norwood. Having started my studies in 2000, I was ordained to the diaconate in June 2003. I am the first boy in a large family of 10 (5 girls and 5 boys). I am married to Angela with three children. On leaving Pope John Secondary Seminary School (Ghana), I went on to study Social Policy and Criminology. I also studied Catering at South East London College (now Lewisham College) and a chef by profession. I was born and brought up in Portsmouth on the south coast of England. My father was English. He died three years ago. 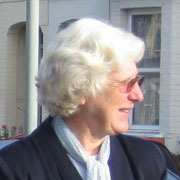 My mother a Scots American from Chicago is still alive and living in Bexhill-on-Sea and I go down to visit her each week. I left home at 18 to go to Coloma College of Education. I taught for three years and then left teaching to work for a travel company. I entered the Daughters of Mary and Joseph in 1975. 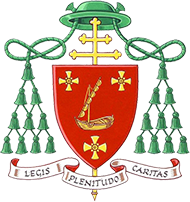 Since making my first profession I have worked in Addiscombe parish, St. Thomas More’s Middlesborough and 14 years in Our Lady and St.Philip Neri, and the Church of the Resurrection parishes in Sydenham (which included being on the chaplaincy team at St. Christopher’s Hospice).